Hopefully you will find some good information here to help you enjoy the TI. No big thoughts or technical lingo here. Just useful and practical knowledge.... ;-). Using CF cards on the TI99. The console only crowd can get some benefit from the CF7 device and it's variants. They show up on Ebay now and then and for the price are very useful..... if you don't have a PEB that is. The CF7 doesn't work and play well with others (meaning you can't use the CF7 with a PEB... even with a splitter cable.) The CF7 and variants appear to be incompatible with existing TI peripherals on a hardware level. As a poor mans storage device it excels. It allows a user to create Virtual disks that can be loaded into the virtual drives and used as if they were floppies. The PEB crew have a more methods and a greater level of sophistication. Both the IDE and SCSI cards are capable of using the CF medium. The IDE folks can use the storage directly on the IDE cards while the SCSI users must insert an SCSI to IDE converter between the scuzzy card and the CF device. The IDE cards are normally modified so that the IDE to CF converter is mounted on the back of the card and powered from it as well. It's a neat device if you can get one. Originally designed by Thierry Nouspikel, the card is fully functional and has a fully developed DSR written by genius Fred Kaal. There is much info available on the net about this device as well as both of these gurus. The SCSI card needs an SCSI to IDE converter as well as the IDE to CF converter. There are two major variants I have seen that are usable on the TI/Geneve systems. 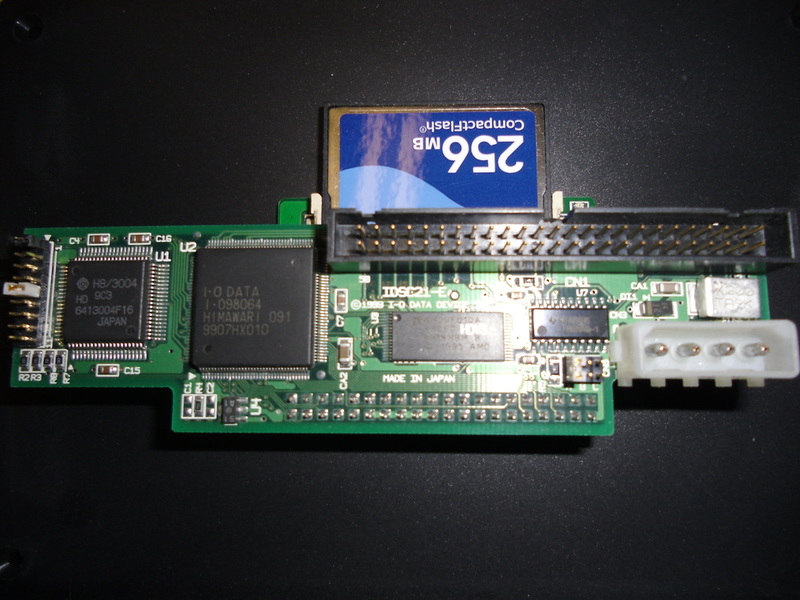 The Acard AEC-7720U SCSI to IDE bridge adapter and the I-O DATA IDSC21E SCSI to IDE adapter. Below is a full table of the jumper settings and a photo graph of the I-O DATA card set up. Please note that the data sheet for this card shows 10 jumpers (J0-J9). Jumper 0 does not exist on the card. J1 is the first. Thanks to Tony Knerr for pointing this out and solving, what was for me, a mystery. In fact Tony reworked the original data sheet to reflect what is physically on the card. It is available as a PDF download directly below..